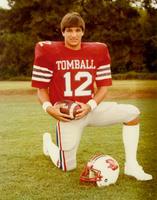 In two years as starting quarterback, Pavlas led Tomball to a 28-2 record and two straight Class 4A title games, earning back-to-back first-team all-state honors in 1985-86. He passed for 3,410 yards and 46 TDs in his two seasons as the starter, and was named to Texas Football‘s Super Team in 1986. Pavlas was a two-year starter at Texas A&M, finishing No. 4 on the Aggies’ all-time list in career passing yardage (3,185) and TD passes (20), and second in completion percentage (56.5).